Due to 2004 hurricanes and illnesses, FLIGHT LINE is only being up-dated as a vehicle by which squadron matters of importance can be found in a central place! Our GALA this year was held on 16 JAN at the PGA Members Club which as usual provided good food and service, all at a reasonable cost. Our honored guest speaker was Rear Admiral Matthew Moffit, who was recently promoted to two star rank. He is an exceptional officer and a man who, during the recent Iraqi campaign, served as Carrier Battle Group Commander in Kitty Hawk. He told the audience about his personal experiences showing how the Carrier Navy again proved its worth in the Iraqi conflict. The admiral was accompanied by his charming and beautiful wife, Magen, and his flag aide, LCDR Woodriff. His speech which blended humor, pathos and personal insights was well received by an appreciative audience who encourgaged him further with questions which he gladly answered. Admiral Moffitt now serves as Commander, Fighter Weapons Group in Fallon, NV. Just prior to this assignment he was Commander, Carrier Group SEVEN in USS Stennis. Coincidently, when it was at Miramar, our departed comrade, Swoose Snead, was its commander prior to his Navy retirement. 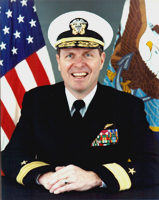 Admiral M. G. Moffit is a second generation Navy admiral. He is the son of retired RADM Lloyd W. Moffit, and his wife Junia, of Ft. Lauderdale, FL. 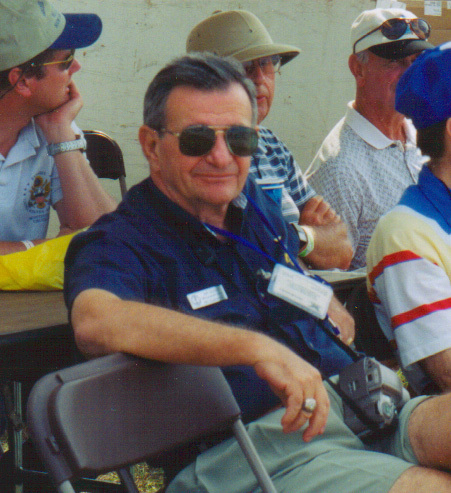 The senior Moffit is the SE Regional Vice President of the Association of Naval Aviation and a founding member of this squadron. 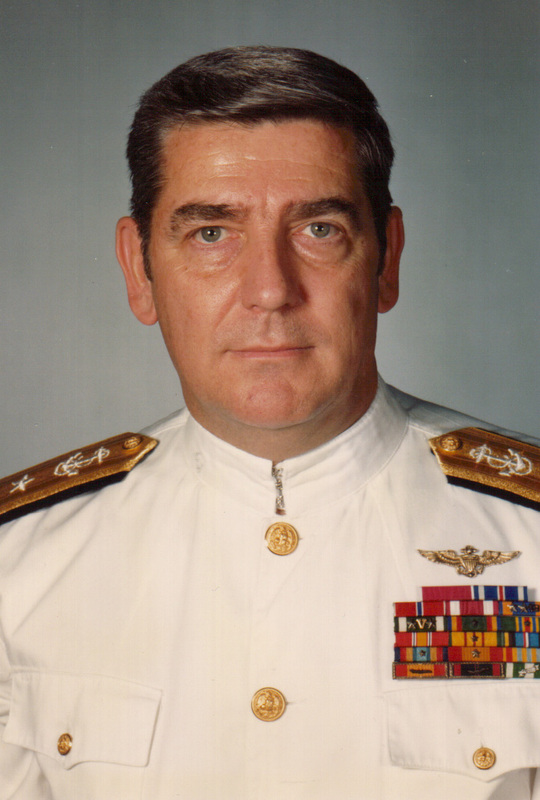 A copy of Admiral Moffit's biography and photo appear under the tab GALA GUEST above. 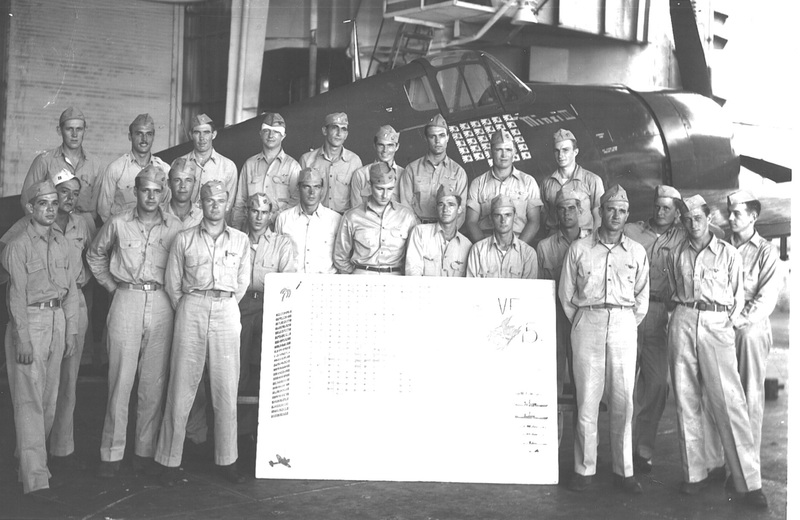 CLICK AIR GROUP 15 BELOW to read about these heros of the air war in the Pacific. For the uninitiated, Ripple Salvo means to create a series of waves with a simultaneous discharge of ammunition, ie "Let it rip! "....Some say this is descriptive of the admiral' s writing style. In 1965, after the North Vietnamese had ignored or rejected more than 100 offers to negotiate a settlement to the war in South Vietnam, President Lyndon B. Johnson ordered a bombing campaign to pound North Vietnam into submission. It was to be a sustained attack that would escalate in severity until the North Vietnamese agreed to talk peace. The bombing began in February, 1965 and became increasingly more intense and violent, especially in the summer and fall of 1967, until President Johnson gave it up as a lost cause in March of 1968. The campaign was called Rolling Thunder. It was bloody for both sides. For me, as a Navy attack pilot, it was a time of duty, survival, and discovery. Between December 1966 and the end of Rolling Thunder I flew more than 200 bombing missions over North Vietnam as an A4 Skyhawk pilot in Attack Squadron 113 embarked in USS Enterprise. It was what I had been trained to do. So every day that Enterprise was at Yankee Station in the Gulf of Tonkin, I would mount up my trusty Skyhawk and fly off to do my duty and dive bomb a string of 500 or 1000-pound bombs into a target in North Vietnam that had been approved for destruction by the President and his brain trust of civilian advisors at his weekly Tuesday luncheon meeting in Washington. Despite the fact that North Vietnam was a third-rate agrarian country, they mustered a formidable defense against our Navy and Air Force bombers. They received considerable assistance from both the Soviet Union and the Peoples Republic of China in equipping their Integrated Air Defense System that included a variety of radars, surface-to-air missile systems, several thousand anti-aircraft guns, and scores of MIG aircraft. It was a gauntlet of lethal fire that was compared by many to be the equal of what our B-24 and B-17 crews had faced over Germany in World War II. During the years of Rolling Thunder the North Vietnamese defenses downed nearly 2,000 Navy and Air Force aircraft, killing 1,800 pilots and crewmen. In addition, 350 of our downed airmen were imprisoned. Our pilots had a two to three per cent chance of getting bagged on each flight over the North, and for missions into the Hanoi or Haiphong area, which we called going downtown, the odds of getting smoked increased to five or six per cent. In other words, for every 100 aircraft flown into the Red River Valley, five or six didnt come home. Our World War II bomber guys had to survive 25 missions over Europe to complete their tour. In Vietnam it took Air Force pilots 100-counters over North Vietnam to rotate home. Navy pilots had to complete two six or seven month carrier deployments on Yankee Station to attain the status of combat limited. This was enough time in the Gulf of Tonkin to log about 200 missions. The odds of surviving the experience were about 80-per cent for Navy Light Attack pilots. With a little luck, and if you did your homework and flew by the rules, you could survive to become combat limited and become exempt from further flying duty in Southeast Asiaunless, of course, you volunteered for more duty, as many did. Every flight into North Vietnam required careful planning and good coordination with supporting aircraft providing electronic jamming, anti-missile and anti-aircraft fire suppression, and accompanying fighter cover aircraft to counter the MIGs. It took a dozen or more of these support aircraft to clear the way for the dozen or so attack dive bombers assigned to strike the target. And if the bombers missed the target, the whole effort had to be repeated until the target was destroyed. The bomber pilot rules were written in blood. If you got low or slow, you probably got bagged. If you flew a straight and predictable flight path, you made it easy for the gunners. If you made multiple passes on the same target, you were unlikely to escape in one piece. In short, the skies over North Vietnam were an unforgiving place for the careless or foolish. The North Vietnamese defenders, who called us Yankee Air Pirates, commanded respect and made the disrespectful pay dearly. In addition, to remain mentally alert and effective required the development of an attitude of invincibility. You had to shield yourself from the worry and stress of going into this dangerous place every day by believing they cant hit me. This was never true, of course, but only by shrouding your vulnerability in the fictitious cloak of invincibility could you continue to press on through the enemys defense to kill your target. I called it fleeing forward. In the face of danger we either fight or flee. A bomber pilot armed with a load of bombs and assigned a target plans and executes a flight path through the sky that enables him to accomplish his duty. As he closes in on the target, the level of opposition increases. The instinct for survival dictates a decision to reverse course and flee. The sense of duty demands a decision to fight-- to press on and attack and kill the target. As the intensity of enemy fire increases, the bomber pilots dilemma increases. This is where his fighting spirithis courageis called to question. Does he waver and sacrifice concentration on doing his duty, or does he become imbued with the spirit of attack borne in a brave heart (German fighter pilot Adolf Galland) and overcome fear and press an attack to kill the target? He flees forward and fights. Every man who has faced this decision discovers the limits of his courage and how he will react to life threatening danger. The discovery is a life altering experience and one to be treasured. Unfortunately, for all the skill and courage expended by our air forces in delivering more bombs on North Vietnam than were delivered on Europe in all of World War II, we failed to achieve our objectives. North Vietnam proved too adaptable, resilient, and tenacious, and Rolling Thunder was abandoned. As we destroyed the bridges, the enemy built bypasses. As we destroyed his power plants and facilities, he dispersed, buried and disguised new ones. He put more than a half million people to work repairing the damage we inflicted almost before we could assess the accuracy and efficiency of our bombing attacks. In spite of our best efforts we never could stop the flow of material down the Ho Chi Minh Trail required to sustain the war in South Vietnam. We failed, and the war in the South continued on for several more years until David finally beat Goliath. Since 12 May, directly after the ANA Symposium at the National Museum of Naval Aviation in Pensacola, and a brief visit to Golden Eagle, retired CAPT Slim Russell and lovely Ede, in Sarasota, this editor has been hit by two medical problems in series. This accounts for the lack of attention being paid to keeping FLIGHT LINE up-to-date as a monthly Naval Aviation newsletter. For the time being it will only be a vehicle by which squadron matters of importance can be found in a central place. BAGHDAD, April 12 -- It was the low point of the war for the two generals. On March 27, outside the city of Najaf, Lt. Gen. William S. Wallace, commander of the U.S. Army's V Corps, met with Maj. Gen. David H. Petraeus, commander of the 101st Airborne Division. As they sat on gray folding chairs in the desert wasteland, the war seemed to be in dismal shape. The critical crossroads city of Nasiriyah had degenerated into a shooting gallery for U.S. convoys. An Army maintenance unit was ambushed on an overextended supply line. In just one day, 36 U.S. soldiers and Marines were killed, taken prisoner, or missing. Before dawn the next day, the first deep strike by AH-64D Apache attack helicopters was beaten back by small-arms fire that downed one chopper and riddled 33 others with bullets. Then a harsh sandstorm swept in, grounding U.S. helicopters, jamming some weapons, bringing most operations to a halt and demoralizing the troops. And they had not yet engaged the Iraqi Republican Guard, which they expected would greet them with chemical weapons. Wallace, wearing cotton cavalry gloves and Wiley-X sunglasses, intimated in an interview after the meeting with Petraeus that, in light of the damage sustained by the Apaches earlier in the week, U.S. commanders were reconsidering their tactics. He added, "We're dealing with a country in which everybody has a weapon, and when they fire them all into the air at the same time, it's tough." Just 13 days later, Baghdad fell. What ended as a military victory that toppled the Iraqi government in 21 days was filled with moments of uncertainty, miscues and unexpected successes for U.S. forces. This article is an anatomy of the war as described by dozens of military officials and commanders, including key participants in the decision-making on the battlefield and in Washington. They provided an inside look at a conflict that upended a host of specific assumptions about how the war would unfold even as it delivered the final collapse of Iraqi resistance that commanders had forecast. Some of these participants said the war got off to an unexpected and confused start. But it reached a swift conclusion in Baghdad in part because of the debilitating impact of air power against Iraq's Republican Guard divisions. In particular, they said, a Special Operations campaign to guide bombing attacks against Iraqi forces even in the midst of a howling sandstorm appears to have been far more effective than generally realized. But another Special Operations effort, to persuade Iraqi forces to surrender at the outset of the campaign, was suddenly overtaken by the decision of Gen. Tommy R. Franks, the overall war commander, to start the ground offensive a day earlier than planned. This decision, the commanders and officials said, sparked a roiling argument within the military's elite Special Operations units about whether the start disrupted the surrender plan. Some officers say the course of the war would have been far smoother, with fewer casualties, had they been allowed to bring the surrender appeal to fruition. Despite the successful drive to Baghdad, some commanders still believe the invasion force was too small, and that their supply lines were so stretched that there was a chance that front-line units would run out of food and water. Finally, officers and Pentagon officials said that during the critical second week of the war, when the two generals met outside Najaf, a sharply different assessment of the state of the war emerged between the field commanders and officials in Washington. The war plan was developed during more than a year of argument among Defense Secretary Donald H. Rumsfeld, Franks and other top officers. It had more gambles built into it than is usual for the U.S. military, officials said, and it was designed to encourage military leaders from Franks down to take chances. The size of the invasion force was reduced through a series of high-level decisions, although details are still in dispute. One senior Army planner said that two units -- the tank-heavy 1st Cavalry Division and the fast-moving 3rd Armored Cavalry Regiment -- were dropped from the war plan without much explanation last winter, paring the force to a size so small that it worried a few top Army generals. Two Pentagon officials disputed that assertion. The second big cut in the invasion force came just last month, when a diplomatic impasse with Turkey over the movement of U.S. forces through its territory led to the 4th Infantry Division being removed from the initial invasion force. That was the first pivotal moment in the war. Franks could have asked for time to wait for the 4th Infantry Division's armor to get to Kuwait, but did not. "The only comment that was made was, 'We don't have the 4th, it will be harder,' " according to one Army general who was involved in the discussion. Far more controversial, especially among field commanders and Special Operations officers, was Franks's next move: advancing the date of the ground invasion to Thursday, March 20, and launching it without a preliminary bombing campaign against Iraqi troops. The order to abruptly start on that night caught senior U.S. commanders by surprise and may have doomed their plans to persuade Iraqi army units to capitulate without a fight. Although the U.S. military had been dropping leaflets on the Iraqis for weeks, warning them not to fight, only that day did they start dropping leaflets that gave specific instructions for how to capitulate -- turn the turrets of their tanks and artillery around, put their vehicles in a square, stay at least 1,000 feet away from their weapons and hoist white flags. "We weren't able to get the message out," said Lt. Col. George Smith, a top Marine war planner who had been drawing up schemes to defeat Iraq since January 2002. "If they got the message it, was probably right before ground forces were upon them." The Marines had hoped that an early capitulation by Iraq's 51st Mechanized Division, sitting right on Iraq's border with Kuwait, would set the tone and encourage other Iraqi units to quickly follow its example. Those efforts "didn't bear fruit," said Lt. Gen. James T. Conway, commander of the 1st Marine Expeditionary Force. "I don't think the snowball got rolling properly." The U.S. military had expected mass surrenders on the order of what it saw in the Persian Gulf War a dozen years earlier. Planners forecast as many as 64,000 Iraqi prisoners of war. As of today, they had about 6,200. A Special Operations officer working in the region said the early move also undercut crucial intelligence-gathering efforts by hundreds of Special Operations troops who quietly slipped into Iraq on March 20 to join CIA and military operatives who had been inside Iraq for weeks. The officer said the short time between S-day, when the Special Operations troops moved into Iraq, and G-day, when ground forces moved, "severely impacted" the ability of the advance guard "to build rapport with opposition groups and conduct unconventional warfare with them." He argued that this change in plan helped lead to the initial success of Saddam's Fedayeen, the militia fighters whose persistent attacks on U.S. forces moving through the south proved to be a major surprise of the war. "The end result was the Fedayeen was effective because the unconventional warfare effort did not have time to identify them and neutralize them," the officer said. In addition, he said, the Fedayeen's attacks signaled to Iraqis in the early days that their government might fight and survive. "That small illusion of hope greatly impacted the psy-op [psychological operations] campaign," the officer recalled. The U.S. invasion force moved quickly once it was launched, with the Marines charging into the big Rumaila oil field in southern Iraq, to keep it from being set afire, and the Army's 3rd Infantry Division rumbling northward more than 150 miles across the Iraqi desert. But the war turned ugly on the first weekend, March 22 and 23. Contrary to expectation, the Shiite Muslims of southern Iraq did not rise up to greet the advancing U.S. troops as liberators. Instead, it seemed at times to U.S. troops as if many people in southern Iraq were waiting for them with an AK-47 assault weapon in hand. The ferocity of the Fedayeen surprised the U.S. commanders. "Nasiriyah was more difficult than we envisioned," said Col. Larry K. Brown, the operations chief for the Marines in Iraq. "I thought there would be a few of these knuckleheads out there and we would blow past them. It turned out there were more of them and they were more fanatic." On Sunday, March 23, the worst day of the war for U.S. forces, Iraqis ambushed a convoy of the Army's 507th Maintenance Company that had taken a wrong turn, killing or capturing 12 soldiers. While the Army and Marines were still absorbing the news of those attacks in their rear, worse news came from the front. In the predawn hours of Monday, March 24,the Apache helicopters of the 11th Aviation Regiment went on a first mission to attack the Republican Guard. The full extent of the disaster from gunfire became known the next morning, when Wallace, the V Corps commander, told his subordinates by telephone that battle damage to the helicopters had made the regiment essentially not batt le-worthy. The significance of this was that the Army's premier deep-attack weapon appeared to be neutered. Just days before, an Army general had boasted about how an Apache battalion armed with Hellfire missiles could destroy an armored brigade in 20 minutes. Instead, the regiment had destroyed virtually nothing and had been thoroughly ventilated for its efforts. U.S. intelligence eavesdroppers had detected 50 cell phone calls in the target area as the Apaches approached, a crude but apparently efficient Iraqi early-warning system. A thrown master switch in one town shut off all the lights, a signal for a barrage of fire that threw up a wall of lead. Monday also brought the onset of three days of monstrous weather -- high winds and blinding dust that stopped virtually all helicopter flying and in some cases halted all ground transportation at a time when the military was so stretched there was concern the 3rd Infantry Division would run out of water, according to Army sources. Some units were "black" on food, meaning that they were down to within a day or two of empty larders. The issue of how to secure the long supply lines led some commanders to conclude that the Army needed "more forces, perhaps much more," as one general put it at the time. But the nearest available substantial force -- the 4th Infantry Division -- was still at least three weeks from getting into the fight. As a West Point graduate, I can assure that we took our military history seriously. Most graduates remember the lessons of "The History of the Military Art" others have obviously forgotten. Most Americans would not recall the significance of the date, April 9th as they watched the statue of Saddam Hussein topple in Baghdad and his Ambassador to the United Nations declare "The game is over." One hundred And thirty eight years ago, on April the 9th, 1865 at Appomattox Courthouse, Robert E Lee, West Point Class of 1829, surrendered to Ulysses S. Grant, West Point Class of 1843 to end the bloodiest war in our nations history, the Civil War. There are significant historical lessons to be derived in contrasting Operation Iraqi Freedom and our own Civil War as well as a comparison of West Point generals in both. The motto of the United States Military Academy is "Duty, Honor, and Country." Unfortunately, a few generals (all West Point graduates) have become "armchair analysts" for whom it seems their motto could be "Demagoguery, Hubris, and Contempt." More specifically, I speak of General Eric Shinseki, the irrelevant Army Chief of Staff (West Point 1965); General (ret.) Barry McCaffrey, former Clinton Drug Czar (West Point 1964); and General (ret.) Wesley Clark (West Point 1966), former NATO Commander and aspiring Democrat Party presidential or vice presidential nominee. All of these men, through public pontification dammed the strategy of this war. General Shinseki called for hundreds of thousands more troops to get the job done. General McCaffrey, only four days into active general combat, wrote a contemptuous article on these pages predicting doom and a protracted conflict. General Wesley Clark joined in the anti-American chorus on CNN to question, erroneously, why supply lines had stretched so thin? Why all this wailing and teeth gnashing from men who heretofore proved themselves valiant in combat as junior officers in Viet Nam and the first Gulf War? The George McClellan syndrome fits all too well. Gen. George B. McClellan (West Point 1846), commanded the Union Army in the early days of the Civil War. A pompous man, who held Abraham Lincoln in utter contempt, built an army of well over 150,000 men and embarked on a campaign to capture Richmond and bring a swift end to the southern rebellion. To historians, this is known as the Peninsular Campaign, one of the greatest failures in the annals of American military history. Faced by a confederate force of barely 40,000 soldiers, McClellan hesitated, begged for more troops, worried about long supply lines and basically attacked piecemeal until he deluded himself into believing that the rebels held superior numbers on the field of battle. Had McClellan, with a vastly superior force, struck decisively toward Richmond, (as we did at Baghdad), the Civil War conceivably would have been brought to a swift conclusion, saving millions of lives, both soldiers and civilians. McClellan, after being relieved of command and sent on his way, eventually became the Democrat Party nominee for President in 1864 and was soundly defeated by Lincoln. Generals Clark, McCaffrey and Shinseki are nothing more than the heirs of the McClellan legacy, political generals, who have forgotten our motto for their own self-aggrandizement. Where were these three when their patron, Bill Clinton, decimated the U.S. Army in the 1990's, almost halving our forces for the sake of the phony "peace dividend?" This unilateral disarmament gave our enemies hope and portrayed us as both militarily and politically weak. Why weren't their voices heard as brave men (Black Hawk Down) were sacrificed in Somalia because Clinton and his Secretary of Defense, Les Aspin, wouldn't authorize the use of armor forces, which the field commanders earnestly had sought? As we know now that our failure in Somalia was the impetus for Bin Laden's "9-11" attack. Simple, these three were being politically correct, behaving as the military hating administration told them to, and putting on their second, third and fourth stars. Some basic questions to each of them: General McCaffrey, how did the last "war" you fought, the war on drugs, go on your watch? General Shinseki, isn't it great to know that all you will be remembered for is giving the army black berets made in France? General Clark, will continued political correctness really get you the Democrat party nomination for President or even Vice President? If not you could succeed Chirac in France. The conduct of these men while our troops are under fire is nothing more than reprehensible and, fortunately, stands in stark contrast to General Franks, who conceived and now commands what by any measure has been a brilliant Iraqi campaign. While not a West Point graduate, General Franks is surrounded by graduates of the military academy, who have loyally supported him and the Iraqi Freedom campaign from day one. Men such as LTG John Abizaid (West Point1973); Gen. Frank's chief deputy, Col. David Perkins, Commander of the 2nd Brigade, Third Infantry Division, the first unit into Baghdad (West Point 1980); and Capt. James Adamouski (West Point 1995), killed in combat. When this great victory is finally assessed, those are the men who are the heirs of Grant, Patton and Schwarzkopf. As to the modern McClellan's? Just like the Iraqi regime, it's the dust bin of history for them. Mr. Nalepa is a 1978 graduate of the United States Military Academy at West Point. During active service he was assigned to the 2nd Brigade, Third Infantry Division, in Germany and the 82nd Airborne Division. He is a veteran of the Grenada Rescue mission in 1983. Mr. Nalepa, who runs an exclusive Executive Search firm, is a frequent guest on military and foreign affairs in the Chicago area, with many appearances on the highly rated WTTW program "Chicago Tonight"
The workhorse of the air campaign against the regime of Iraqi dictator Saddam Hussein has been the A-10 Thunderbolt II an ungainly, brutish jet that seems far removed from the glamorous image of the Air Force. Better known as the Warthog, the A-10, universally loved by ground troops and its pilots, has faced uphill battles within the Air Force since it was first conceived in the late 1960s. The story behind the A-10 is compelling and, for the ground-pounding grunt, one with a happy ending. In fact, it is hard to believe the Warthog ever saw the light of day, what with a design philosophy that remains completely foreign to the Air Force technocracy and charged with a mission that the Air Force never wanted. In fact, its supporters beat back its forced removal from service three times. Despite attacks by partisans of the higher, faster, farther school, the A-10 successfully emerged as one of the most ferociously effective, feared and deadly weapons in the U.S. arsenal. Since the 1947 creation of the U.S. Air Force as a separate military service, the U.S. Army has been barred by act of Congress, from operating armed fixed-wing aircraft, guaranteeing the Air Force a monopoly on the skies over the battlefield. Dominated by bomber generals and fighter pilots, the Air Force marginalized the mission of utmost concern to the Army: Close Air Support (CAS) the direct aerial support of front-line ground troops. Lacking an effective CAS platform amongst the early fighter jets, which were hampered by poor endurance and small ordnance loads, in 1963, the USAF was forced to accept a propeller-driven Navy workhorse whose design dated to the closing days of World War II, the Douglas A-1E Skyraider. Slow and lumbering, the Skyraider was able to loiter over an area for hours and withstand enormous damage. It was perfect for CAS missions. Though it remained in service until 1972, the A-1E was superceded in the late-1960s by the Republic F-105 Thunderchief, a fighter-bomber with poor maneuverability that was originally intended to perform nuclear attack missions. The F-105, initially known amongst ground-attack pilots as the Superhog before becoming famous as the Thud, was emblematic of the Air Force mindset one where only two types of aircraft were considered worthy: high-altitude nuclear bombers and nimble, high-tech, supersonic fighters. Even aircraft that would never engage enemy aircraft in dogfights, such as the F-105 and the trouble-plagued F-111, were labeled fighters simply because they were not strategic bombers. With the arrival of the F-105 in the CAS role, the effective denial of air support by ground defenses became a reality, but only when the jets own limited fuel load and lack of maneuverability did not prevent it from reaching the target. It was becoming clear to Congress, as the Army sought to lift its fixed-wing prohibition, that ground forces were not receiving the air support so vital to their survival and the Air Force realized that a new CAS aircraft was needed, lest it lose the air monopoly. With that realization, the A-X, or Attack-Experimental program began, but rather than posting requirements for a high-technology, high-speed attack jet, program manager Pierre Sprey proposed a simple, survivable single-seat plane that could loiter for long periods and prove highly maneuverable at low altitude and slow speeds. What emerged were two very different designs Northrops YA-9, a conventional-looking aircraft with low-mounted engines and a streamlined fuselage, and Fairchild-Republics ungainly-looking YA-10. The prototype A-10 looked like nothing in the Air Force inventory - with square-tipped unswept wings, twin-tails, podded engines mounted high on the rear fuselage and a seven-barrel Gatling gun protruding from its chin. It was designed for the battlefield. Rather than being streamlined for aerodynamic efficiency, the A-10 was literally designed around the massive 30mm cannon created specifically for the A-X program the General Electric GAU-8/A Avenger gun system. Fully loaded, with ammunition drum and loading mechanisms attached, the GAU-8/A measures more than 20 feet long and weighs almost 4,000 lbs. The Gatling gun fires a mix of depleted uranium (DU) and high-explosive (HE) shells, each nearly a foot in length, at a rate of over 3,900 rounds per minute fast enough to expend a combat load in less than 15 seconds. Used against armored vehicles, the GAU-8/A shreds conventional armor plate and overwhelms even the latest reactive armor, providing just enough brute force and lack of finesse to alienate the core of the U.S. Air Force. Fairchilds engineers built the Thunderbolt II with survivability in mind, incorporating manual control backups in the event that the widely-separated hydraulic systems were damaged; the cockpit was surrounded by a bathtub of titanium armor, designed to withstand large-caliber anti-aircraft fire; fuel tanks were located only in the fuselage, as ground fire was much more likely to strike the wings; the wings themselves were large enough that an aircraft could continue flying with more than half a wing shot off and even the landing gear was designed to fit into pods so that it would still cushion a landing, even when retracted. Speaking of the extreme toughness posessed by the A-10, Sprey, who left the infighting at the Pentagon to found a recording studio, recently commented, The pilots love them. Any of our jet fighters can be shot down by a .22-caliber rifle. But you can punch an A-10 full of holes and it will come home with sky showing through the wings. The competition proved that the A-10, built to operate from primitive forward bases and whose large wing made it both nimble at slow speed and forgiving to novice pilots as well as able to carry enormous combat loads, was far superior to its rival. And thus began the A-10s first battle for survival. The Air Force leadership believe that by funding the A-X program, it would prove to the Army and Congressional leaders that it was serious about fulfilling the CAS mission needs. Air Force leaders hoped that through a good faith effort, the USAF would not be forced to accept the A-10 into its flock, since procuring the A-10, they argued, would take money away from the fledging F-15 fighter and B-1A bomber programs, which were top strategic priorities within the post-Vietnam U.S Air Force. Congress, however, saw the A-10, which cost but $3 million apiece, as an affordable bargain compared to the then-$15 million dollar F-15 and the B-1A, which was projected to cost more than $100 million a copy, and ordered the Air Force to purchase more than 650 from Fairchild. Envisioned to play a critical role in defending Western Europe from Soviet tank forces as they pushed their way through the Fulda Gap, the A-10 lacked every defining feature of its contemporary stablemates, the F-15 and F-16. Built without radar or an inertial navigation unit, pilots relied on maps, visual references and dead-reckoning to navigate in a cockpit dominated by round steam gauge instruments rather than multi-function computer displays. In fact the only concession to mid-1970s technology found within the cockpit was a small TV display used to aim optically-guided AGM-65 Maverick air-to-ground missiles. A small laser-targeting pod was sometimes mounted alongside the cockpit to provide a rudimentary precision guidance. 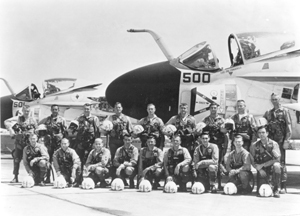 Such high-altitude precision was considered unimportant for CAS, where few missions would be flown above 2,000 feet or at speeds greater than 350 knots. For thirteen years, the A-10 remained unchanged, remaining ever vigilant for a mission that never came. Eventually, it became apparent that it never would. With the perceived loss of its primary mission, critics of the A-10 again moved in for the kill, determining that the Thunderbolt II would be withdrawn from U.S. service by the beginning of 1992, to be replaced in its CAS mission by the F-16, the USAFs lightweight fighter-turned bomber, with a modification to accept a version of the GAU-8/A housed in a belly-mounted pod. On August 2, 1990, the Warthog won a reprieve with the Iraqi invasion of Kuwait and the subsequent U.S. build-up in the Middle East. Despite the high-technology focus of Operation Desert Storm, 144 A-10s deployed to Saudi Arabia without night-vision capability, GPS support or laser-targeting, yet they flew more than 8,900 sorties nearly 30 percent of all Allied missions and accounted for 50 percent of confirmed Iraqi equipment losses, including nearly 1100 or Iraq's 1,500 tanks, 1,500+ armored vehicles and 51 SCUD missiles and launchers. Even with only a marginal precision capability, A-10s fired 90 percent of Maverick missiles used in the Gulf War, employing them with great success. Designed to be easy to service in the field, A-10s maintained a 96 percent mission availability rate the highest of any aircraft type during the first Gulf War and proved the designers durability claims, repeatedly returning with large holes in the wings and fuselage. Iraqi POWs related to their American captors just how much they feared the Warthog, with its distinctive shape and powerful cannon, above all other coalition jets. Almost silent from the frontal aspect and when flying above 5,000 feet, the A-10 became known as whistling death, amongst Iraqis for the high-pitched whine of its General Electric TF-34 high-bypass turbofan engines heard once the aircraft had passed low overhead and the distinctive burp of the GAU-8/A 30mm Gatling gun. Despite the high rate of battlefield effectiveness during Desert Storm, the full potential of the A-10 was not realized by Air Force planners which used the A-10 primarily as a SCUD hunter and to mop-up armored units during the early days of the air war, preferring to send high-tech platforms like the F-16 and F-15E Strike Eagle, equipped with smart bombs against targets for which the A-10 was designed. Only once those plans revealed their inherent flaws and the strike fighters were called away for more appropriate missions, did the A-10 get the chance to truly shine, as some of the most vocal critics of the Warthog began to sing their praises. Lieutenant General Charles Horner, who planned the air war component of Desert Storm said, during a briefing, I take back all the bad things I have ever said about the A-10. I love them! Theyre saving our asses! Once finished in the Gulf, the A-10 again faced the possibility of being withdrawn from service, but the experience during the Gulf War, and testing of the GAU-13 podded cannon on the F-16 again proved the inherent inaccuracy of pod-mounted gun systems. Further still, the F-16 was already being tasked with replacing the aging F-4G Phantom SAM-hunters known as Wild Weasels and it became clear that pilots of the airborne Swiss Amy knife were becoming overburdened. Despite being spared the axe, the A-10 saw a dramatic reduction in numbers, with more than 260 Warthogs being sent to the Air Forces Aerospace Maintenance and Regeneration Center (AMARC) - better known as the Boneyard- in the Arizona desert. The remaining 390 or so A-10s were primarily distributed to Air National Guard (ANG) and Air Force Reserve (AFRES) units, with only a small number remaining in active-duty service following the military draw-down of the early 1990s. Being relegated to ANG and Reserve units did not mean that the A-10 would languish in obsolescence, as the low-tech jet began to catch up with the rest of the Air Force. Originally designed for a service life of 8,000 hours, by 1994, most A-10s in service had flown between six and eight thousand hours. Under the auspices of a service life extension program (SLEP) aimed at keeping the Warthog in service until at least 2008, a number of significant upgrades and enhancements began to be added to the austere A-10s in service with Air Combat Command (ACC), ANG and AFRES units. First and foremost amongst these upgrades was the Low Altitude Safety and Targeting Enhancements (LASTE) System. LASTE incorporated a new computer control system into the A-10, serving to aid in greater bombing accuracy and functioning with the Ground Collision Avoidance System (GCAS), which reduced the danger of pilot disorientation at low-altitude by automatically returning the aircraft to a safe altitude and attitude in the event of an imminent collision with the ground. In addition, LASTE provided the A-10 with night vision-compatible cockpit displays and lighting - meaning that A-10 pilots no longer literally flew night missions in the dark - and a fully-functional heads up display (HUD), which projects relevant flight and targeting data in front of the windscreen, keeping the pilots eyes out of the cockpit and off of the instruments. The A-10 inventory is currently receiving another significant upgrade aimed at providing GPS and inertial navigation capability. An upgraded multi-function display that replaces the TV screen in the upper-right corner of the instrument panel will provide the A-10 pilot (who call themselves Hog Drivers) with an electronic moving map, marking the first time that Hog drivers will not be forced to rely on paper maps and dead-reckoning. The upgrade, known as the Embedded Global Positioning System/Inertial Navigation System, or EGI, also brought the A-10 upgraded communications equipment, making the Forward Air Controller (FAC) mission it adopted during the Gulf War a much more effective one. FACs act as airborne air traffic controllers and target locaters for strike fighters and bombers, a mission at which the A-10, with its long loiter time and incredible visibility from the cockpit, excels. Just beginning to reach the active fleet of Warthogs is the Hog-Up program, which will effectively double the service life of Thunderbolt II airframes, ensuring that the A-10 will serve with the Air Force until its currently planned retirement date of 2028. Hog-Up will replace select wing panels on most in-service A-10s, as well as preparing those in storage at AMARC for wing replacement or cannibalization in the event that the operational inventory falls below minimum levels. In addition, Hog-Up will replace the A-10s manually-activated chaff and flare decoy system with an automated system on all aircraft by 2005. Chaff is used to defeat radar-guided missiles and flares lure infrared-guided missiles, such as the shoulder-fired SA-7 surfaceto-air missile, away from the aircraft. Future upgrades will likely focus on upgrades to the TF-34 turbofan engines, bringing greater thrust and fuel-efficiency to the Warthog as it approaches its projected retirement after nearly 50 years of service. Having participated in combat missions in Kosovo and Afghanistan, the Warthog has again proven its worth in current operations in Iraq, flying a significant portion of sorties during Operation Iraqi Freedom. During the early portion of the air campaign, A-10 pilots routinely flew three to four missions every 48 hours, focused primarily on destroying the capability of Iraqs much-vaunted Republican Guard, SCUD hunting in western Iraq and close air support of ground forces rapidly advancing from the south. With the allied seizure of forward air bases inside Iraq, the A-10s shifted their attention towards tank plinking of the Iraqi armored divisions outside of Baghdad and on providing FAC support over the city itself. The maintenance-friendly A-10, again has achieved high mission-readiness rates and the long loiter times over targets have resulted in very little (if any) ordnance brought back from Warthog missions, especially when compared to sorties by F-16 and F-15E jets. The A-10s durability has also been highlighted over Iraq, with at least three Warthogs damaged by anti-aircraft fire and surface-to-air missiles. Despite severe damage, including, at least one plane having nearly lost an entire engine, all made it back, although a fourth A-10 was downed and the pilot recovered with minor injuries. The pilot of one of the A-10s, known by the callsign Killer Chick, who lost all hydraulic controls from ground fire over Baghdad noted, the plane works as advertised... The stick was a lot harder to move, but it worked. Speaking to a reporter the day after her Warthog was damaged, she had already flown two more missions in support of ground troops. Like other Hog Drivers, she routinely flies into some of the most dangerous battlefield conditions with confidence and shares an affinity for the troops on the ground: Were here to help the guys out on the ground and when they need our help, were there for them, she told CNN. Written by Daniel V. Smith, JINSA's Manager for Research and Communications. Detail photos of the damage to the A-10 flown by "Killer Chick"
Articles, graphics, and pictures also protected by the rights of their respective owners. Land and Sea Collection is the source for fine quality ship and aircraft models, vintage ships clocks, polished brass nautica, marine antiques, and is the internet's largest seller of used marine sextants. CLICK HERE! 4 Inch Embroidered Squadron Patch Now Available. $6.00 Cash or Check payable to McCampbell's Aces Squadron, Inc.
(1) Those who are Naval Aviators, the great majority. The aviators are about equally split between the USNA, and NROTC. (2) Those who have supported and maintained Naval aircraft as air crew, about 20 percent. (3) Those who wish they had been Naval Aviators or had flown, supported or maintained those wonderful machines. (4) Those who just like the idea of belonging to an organization built on admiring the greatest group of individuals in the World. An increasingly large number of the group are friends and supporters without military experience. (5) And a very special group of men that flew with then CDR McCampbell during WW II as members of Air Group 15. 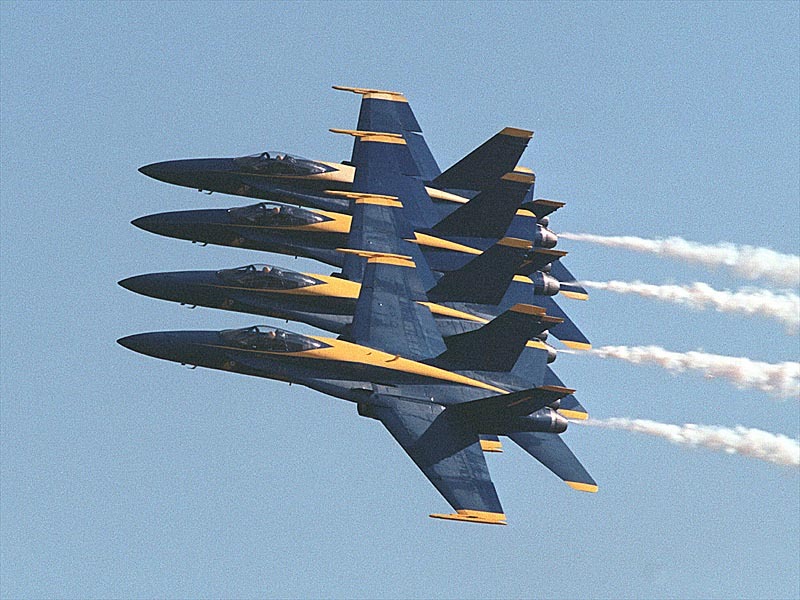 The squadron's purpose is to support Naval Aviation history, legend, and tradition by educating the public in its importance to National Security. The squadron intends to make annual contributions to worthwhile charities, and other tax exempt organizations, that support needy causes with a Naval affiliation. The only requirements to become a member is that you first join the Association of Naval Aviation. National dues are only $35 per year, and for this you get a slick publication, WINGS OF GOLD which covers all the various aspects of Naval Aviation. Second, pay Local dues of only $15.00 per year which are fully tax deductible. And if you want, but not required, provide the squadron with a biography of your flying exploits along with some pictures. Corporations, Foundations and other sponsors are welcome by both the ANA and this squadron! Becoming a member of National is a prequalification to becoming a member of MCAS. Membership qualifies you to attend all squadron events, which includes a Welcome Back gathering in November, our annual January GALA, a April Twilight Rendezvous, and various other happenings, such as the USS McCampbell visit, and others not yet announced. Our monthly newsletter FLIGHT LINE is available to to everyone free of charge. The tabs across the top of FLIGHT LINE's Feature page are pull down menus. Click on them and they open. Read who we are, our backgrounds, meetings and other activities, feature articles, and other Naval Aviation news items of noteworthy interest. 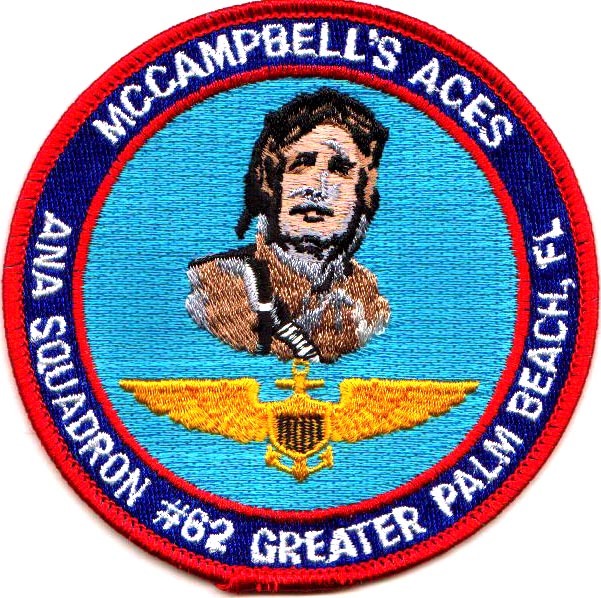 First-time new members receive a McCampbell's Aces 4 inch emblem patch for the reduced price of $ 4.00! (When available) and whatever other goodies may seem appropriate from time to time. Membership also provides the opportunity, for those interested, in helping steer McCampbell's Aces, now and in to the future. To join, call The Association of Naval Aviation HQ, at 1-703-960-2490, and ask for Memberships, between 9 a.m. and 4 p.m. (Eastern time), Monday through Friday, except holidays. Payment may be conveniently made by major credit card. Then send a check payable to McCampbell's Aces Squadron, 1320 Tidal Pointe Blvd., Jupiter, FL 33477. Please make sure to include your telephone number and email address. Make sure to say you want to be an "ACE"! 'Amazing' Satellite Photos of Space Shuttle Explosion Netlore Archive: These stunningly clear, close-up images purporting to show the Space Shuttle Columbia blowing up in orbit are circulating via email. Were they really taken by an Israeli spy satellite? "I am researching my father, Basil Manley Rich's service history. I have his military history and some records which contains information that he also was a survivor of the Torpedo Squadron EIGHT. His dates are June 5,1942 -Dec 9, 1942. Can you give me some resources I could go to research and confirm this information." Coincidentally, I had met retired Captain Bert Earnest Earnest in Sarasota, FL though my good friend Slim Russell, a couple of years ago, and through Bert, retired CDR Harry Ferrier. At the Battle of Midway in 1942, Ensign Earnest and Radioman/Gunner Ferrier flew to meet the Japanese Fleet as members of Torpedo Squadron 8 in a Grumman TBM. Even though George Gay is mostly credited with being this squadron's sole survivor, the fact is that Bert and Harry, after their successful attack, made it all the way back to Midway Island in a badly shot up plane with their third crew member having been KIA. ENS Earnest was awarded two Navy Crosses and Harry Ferrier, the Distinguished Flying Cross for their bravery. Bert, Harry and I have been in occasional contact since meeting, so I got an email off to both of them. I received an immediate response from Harry who simultaneously contacted Mrs. Bunch. (Bert is notorious for not looking in his mailbox. Here is what Harry wrote her. I am enclosing a copy of the picture that I mentioned in my e mail message. The picture was taken at Henderson Field, Guadalcanal in September 1942. We are on the wing, or in the cockpit of a TBF-1 Avenager torpedo plane. We were preparing to take off on a local bombing flight. 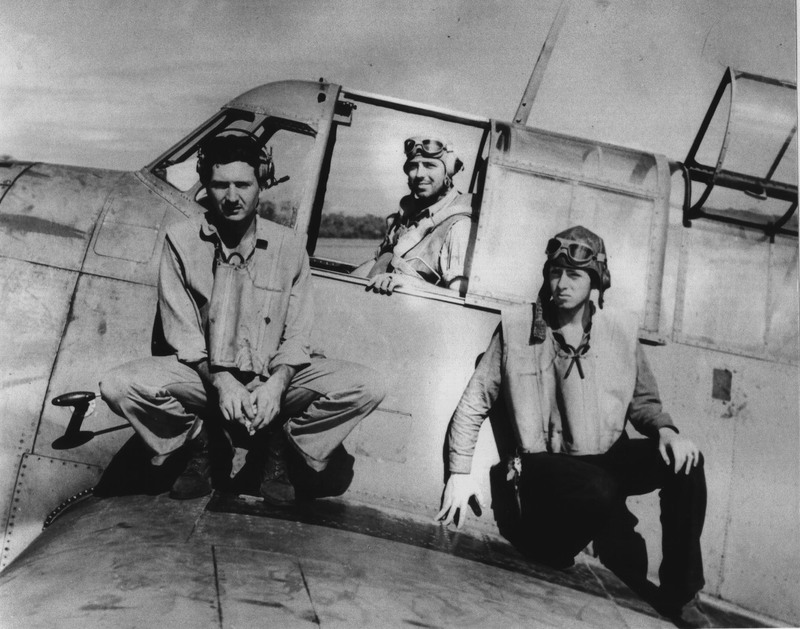 Pictured going from left to right: Basil Rich, Aviation Chief Ordnanceman, USN, Ensign Albert K. Earnest USNR (the pilot), and Harry H. Ferrier, Radioman Third Class, USN. We were all attached to Torpedo Squardon Eight. I may have mentioned earlier that Ens. Earnest and I had flown together at the Batle of Midway. Our aircraft was the only plane of the twenty-one planes from our squadron that returned from the battle. We were both wounded and our turret gunner was killed. Ens. Earnest remained in VT-8, but I was assigned to Torpedo Squadron Three n USS Enterprise, CV-6. both squadrons participated in the Invasion of Guadacanal on August 6, 1942, and subesequent defense of the area. Enterprise was bombed on August 24, 1942, and severely damaged. Part of VT-3 was then sent ashore in the New Hebrides Is. to support the Marines. VT-8 was on the carrier USS Saratoga, CV-3. Saratoga was torpedoed late in August 1942, and as a consequence, VT-8 then came ashore. I rejoined them and then few with Ens. Earnest and your Father on Guadalcanal. Our squadron was relieved in November 1942, and returned to San diego, CA and decommissioned on Dec. 12, 1942. I went on to serve another combat tour on USS Yorktown, CV-10 in 1943-44. I was then flying in Douglas Dauntless SBD-5 dive-bombers. Force Majeure What lies behind the military's victory in Iraq. So when and how did the U.S. military get this good? The elements of swift victory in Gulf War II have been well laid-out: the agility and flexibility of our forces, the pinpoint accuracy of the bombs, the commanders' real-time view of the battlefield, the remarkable coordination among all branches of the armed services (Army, Navy, Air Force, Marines) and special operations. But these elements, and this degree of success, have not been seen in previous wars, not even in the first Gulf War 12 years ago. Three major changes have taken hold within the military since then "a new war-fighting doctrine, advanced digital technology, and a less parochial culture. The new doctrine was put in motion in 1983, a decade before Operation Desert Storm, when the U.S. Army's Command and General Staff College, at Fort Leavenworth, Kan., created an elite, one-year post-grad program called the School for Advanced Military Studies. The school's founder was a colonel "soon promoted to brigadier general" named Huba Wass de Czege (pronounced VOSS-de-say-ga). He was in the forefront of officers who had served in Vietnam, witnessed the disaster firsthand, and were eager to change the way the Army thought about combat. In 1982, Wass de Czege had written a major revision of the Army's war-fighting manual, FM 100-5, the official expression of Army doctrine and the foundation for all decisions about strategy, tactics, and training. 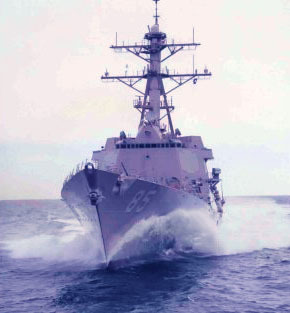 The previous edition, written in 1976 by Gen. William DePuy, had recited a strategy of attrition warfare, a static line of defense against the enemy's strongest point of assault, beating it back with frontal assaults and superior firepower. Wass de Czege's rewrite outlined a strategy emphasizing agility, speed, maneuver, and deep strikes well behind enemy lines. By the time of Desert Storm, a small group of Wass de Czege's students had been promoted to high-level posts on the staff of Gen. H. Norman Schwarzkopf's Central Command. This group of officers, who self-consciously referred to themselves as the "Jedi Knights," designed the ground-war strategy of the first Gulf War, and it was straight out of Wass de Czege's book "the feinted assault up the middle, the simultaneous sweep of armored forces up to the Iraqi army's western flank, the multiple thrusts that surrounded the Iraqis from all sides, hurling them into disarray before their final envelopment and destruction. The Marines, meanwhile, were going through a similar transformation. Col. Mike Wiley, vice president of the Marine Corps University at Quantico, revised his branch's war doctrine on the basis of a 1979 briefing called "Patterns of Conflict" by a retired Air Force colonel named John Boyd. Boyd too had concluded that successful warfare involves surprise, deception, sweeping quickly around flanks, and creating confusion and disorder in the enemy's ranks. The Marine Corps commandant at the time, Gen. Alfred Gray, considered himself a Boyd disciple and ordered his officers, who led the assault into Kuwait, to avoid frontal assaults and to maneuver around the Iraqis and attack their flanks. For the Air Force and Navy, Desert Storm saw the inauguration of "smart bombs" that could explode within a few feet of their targets. Fewer than 10 percent of the munitions dropped in Desert Storm were smart bombs; the weapons were new and expensive (between $120,000 and $240,000 apiece); not many had been built; and they still had lots of technical bugs. By 1999, in the war over Kosovo, smart bombs were more reliable and a lot cheaper ($20,000 each); they constituted about 30 percent of bombs dropped. In Afghanistan, the figure rose to 70 percent, which is probably how the math will work out in Gulf War II as well. The war in Afghanistan, however, saw three innovations that would alter the way America fights wars. First, high-tech smart bombs were combined with high-tech command, control, communications, and intelligence. A new generation of unmanned Predator drones flew over the battlefield, scanning the terrain with digital cameras and instantly transmitting the imagery back to command headquarters. Commanders would view the imagery, look for targets, and order pilots in the area to attack the targets. The pilots would punch the target's coordinates into the smart bomb's GPS receiver. The bomb would home in on the target. Total time elapsed: about 20 minutes. By comparison, in Desert Storm, the process of spotting a new target, assigning a weapon to hit it, then hitting it, took three days. The second new thing about the U.S. strategy in Afghanistan was that it was truly a "combined-arms" operation; a battle plan that involved more than one branch of the armed services, working in tandem. This had never really happened before. Often using the new high-tech drones as the communications link, Army troops on the ground called for strikes from planes flown by Air Force pilots. Some of these planes, such as B-52 and B-1 bombers, had been built 30 or 40 years earlier to drop multi-megaton nuclear bombs on the Soviet Union. The notion of using them to drop 2,000-pound conventional weapons, in support of ground troops, would have appalled an earlier generation of Air Force generals. Over the previous decade or so, that generation of generals, weaned on Curtis LeMay and the Strategic Air Command, had died out, and so had SAC's central enemy and target, the Soviet Union. Meanwhile, the '90s saw the creation of a new Joint Forces Command, which promulgated doctrines, field manuals, and war games that envisioned all the services fighting wars together, under command structures that were unified or at least "interoperable." One such document, called "Joint Vision 2020," issued in June 2000, emphasized a strategy of "full-spectrum dominance," involving the conduct of "prompt, sustained and synchronized operations with combinations of forces space, sea, land, air and information a "synergy of the core competencies of the individual services, integrated into the joint team a whole greater than the sum of its parts." Written doctrines are one thing, actual operations another. However, the new structures and doctrines did breed, in the words of one Joint Forces Command publication, "a common joint culture." The institutional barriers of inter-service rivalry, even hatred, were gradually broken down. Once new technologies made joint coordination possible, and once the war in Afghanistan showed that coordination could reap tremendous advantages, resistance seemed futile. Operation Desert Storm was really two wars "the air war and the ground war" each fought autonomously and in sequence. Gulf War II was an integrated war, waged simultaneously and in synchronicity, on the ground, at sea, and in the air. The vast majority of airstrikes, from Air Force bombers and attack planes as well as Navy fighters, were delivered on Iraqi Republican Guards, in order to ease the path of U.S. Army soldiers and Marines thrusting north to Baghdad. Gen. Schwarzkopf didn't think much of special ops, so didn't use them in Desert Storm, except toward the end of the war, to go hunt for Scud missiles in Iraq's western desert. In Afghanistan, these forces were central. They could be parachuted into the country in small numbers, set up airfields, and develop contacts with rebel leaders. The information about Taliban targets, which the Predator drones transmitted back to headquarters, usually came from a special-ops officer riding on horseback with a laptop. (no embedded reporters there) and by the laptop-wielding joint-forces crew in Qatar (a few embeds, but no access to that part of the operation). What they were and are doing, however invisible, formed a large part of what made this war so stunning and new. April 9, 2003 -- AMERICA'S armed forces entered the war in Iraq with the finest equipment, the best training and the most advanced doctrine in the world. Our military will end the war with priceless practical experience of what works on the 21st century battlefield and what doesn't. No matter how much thought is applied to war, theory is never a substitute for experience. Even the most insightful military thinkers will not get everything right. We know that. That's why we stress flexibility at all levels of training and planning. Our military is better than any other at adjusting to new realities while the bullets are still flying. Many of the nitty-gritty lessons learned will only emerge after the dust settles and the services can audit everything from specific weapons effects to the most appropriate basic load of ammunition for tanks in urban combat. But, at a broader level, critical lessons are already evident. Perhaps the greatest revelation has to do with the continuing value of ground forces. Every few years, critics who insist that, this time, technology will win the war with little or no help, must be proven wrong. And while the remarkable advances in precision weapons delivered from the air have enhanced our ability to make war more efficiently while reducing the price civilians pay, what has gone largely unnoticed is the emergence of another form of precision weapon: ground troops. Traditionally, ground forces have been war's blunt instrument. But, in this campaign, our Army and Marine units have been applied throughout the depths of the battle-space with unprecedented efficiency. Our troops have done more with less than any army previously has done. Dramatic improvements in intelligence and communications allowed our forces to focus combat power at the right place and time - before the enemy could begin to react - in a manner that gives one Army division the battlefield effect of multiple divisions in past wars. This does not reduce the need for any of the divisions currently in our inventory - a meager ten in an Army with global commitments. On the contrary, our Army and Marine Corps are sized austerely for our country's responsibilities. But it does revolutionize the impact of ground forces. More and more, our forces resemble the Roman legions of the empire's golden age, invincible against all threats posed by barbarians. This isn't a revelation to military professionals. Planners and force designers have been working toward this goal of intensifying combat effectiveness for more than a decade. But the doctrine and technologies had to be proven on the battlefield. Now the military's forward-thinkers have been vindicated. That said, numbers still matter. While our forces have conducted the most impressive military campaign in history, another heavy division on the ground would have allowed them to press on immediately to Tikrit, the regime's last citadel, and to open the back door to Mosul and Kirkuk in the north. This role will fall to the hi-tech 4th ID as it enters the war zone, but there has been a time-lapse between opportunity and our capability to exploit it. Our troops fighting in Baghdad would also welcome additional comrades beside them. They're doing a spectacular job under tough conditions. But more troops on the ground would enable us to finish the Iraqi resistance even more swiftly and safely. In urban operations, sheer presence can be decisive. Other advances that have proven their worth include 21st-century joint operations - all the services working in much-improved cooperation with one another - and the increasing integration of special operations forces into conventional operations and even tactical encounters. While the strategic air campaign did not meet initial expectations, it remains a worthy effort to attempt to reach beyond intervening armies and innocent civilians to destroy an oppressive regime's leadership. Attacks against leadership targets, even when the immediate results are disappointing, send a valuable warning to other dictators that they will not be able to hide behind civilians forever. Practical lessons include the need for the Marine Corps to receive more funding to beef up and refresh its inventory of combat vehicles. Performing valiantly, the Marines have disproved the old adage that the Corps cannot sustain a fight deep inland. But the likely contours of future wars mean our Marines need to be supplied with upgraded equipment for future campaigns. The Marines are particularly good stewards of tax dollars. We are foolish not to treat them more generously. Our attack helicopter fleet faced unexpected levels of risk on the battlefield, with Apache tactics leaving aircraft more vulnerable to ground fire than anticipated. Yet, the Apache pilots - and those flying all other types of helicopters - swiftly adjusted their techniques, determined to get right back into the fight. No one has been more courageous in this war than our tactical aviators. Our attack helicopter doctrine will be heavily rewritten after this war, based on lessons learned. That's in the normal order of things. Friendly-fire incidents also continue to bedevil us - a problem that may never be solved entirely on the hyper-velocity, fluid battlefields of this century. No military gets everything right, no matter the intensity of its efforts to forecast the future. The goal is to get it right to a decisively greater degree than your enemies have done. We have passed that test with the highest marks in history. Ralph Peters is a retired military officer and the author of "Beyond Terror: Strategy in a Changing World." Stratfor has always said that the U.S. military campaign in Iraq would be the preface to other campaigns and the reordering of the Middle East. The war isn't quite over, but the reordering of the region is already under way, with some remarkable successes for the United States. Even Syria represents a success for the United States, since it allows the Americans to demonstrate that they are not tired after Iraq and are ready for new challenges. The Iraq campaign is over, but the U.S. war on al Qaeda and Islamic radicalism continues. This is an insight that is finally sinking in around the world and in the United States as well. As Stratfor has argued for quite a while, Iraq was not a self- contained war but a campaign designed to achieve certain necessary ends -- geographic and psychological -- in a much longer and broader war. Therefore, rather than closing off conflict, the end of the war in Iraq set the stage for follow-on campaigns -- with a confrontation starting with Syria. The logic inherent in the American position was always apparent. After the Sept. 11 attacks, the United States was stunned and devoid of strategy. The campaign in Afghanistan was a logical, reflexive event. It did not rise to the level of strategy, but was simply a short-term exercise designed to disrupt al Qaeda operations. The long-term strategy for destroying al Qaeda depended on motivating other countries not to permit their citizens to enable al Qaeda -- and to stop any governments that might be contemplating direct support from carrying it out. The occupation of Iraq provides the United States with a platform for carrying out that strategy. * Saudi Arabia, which had vociferously opposed the war and refused to participate, quietly changed its position in the weeks leading up to the U.S.-led attack -- permitting U.S. access to its command and control center at Prince Sultan Air Force Base, permitting aircraft to stage out of Saudi territory and allowing some ground forces to use Saudi ports for deployments. Saudi leaders understood that the United States was going to war regardless of what the United Nations did, and that it would win. Rather than continuing futile opposition, Riyadh changed its position before the war began. We assume that the Saudi level of cooperation with U.S. intelligence over al Qaeda's presence in the kingdom -- and flows of money from people inside the kingdom to al Qaeda -- increased as well, and will remain increased. * Jordan also opposed the war publicly, but even more than House of Saud, King Abdullah understood the necessity of the war. Abdullah also understood that Washington's interest in suppressing radical Islamic groups was also in the interests of the Hashemites, and he therefore permitted the basing of fairly substantial forces in Jordan, particularly those used to secure western Iraq. * Turkey did not cooperate with the United States, at least to the extent of allowing U.S. troops to pass through Turkey in large numbers. Retrospectively -- and probably prospectively as well -- this did not represent a major challenge to the United States, particularly if Ankara cooperates moving forward. Regardless of Turkish behavior, Washington needs Turkey; it is the foundation of U.S. geopolitical strategy in the region. Moreover, the United States is the guarantor of Turkey's national security. The two will cooperate. Washington is going to make certain that limits are placed on the Kurds in Iraq. The Turks, on the other hand, invited the Israeli foreign minister to visit Turkey last weekend, the topic of conversation: Israeli modernization of Turkish tanks. The real topic: making sure that the Turkish-Israeli relationship remains firm, which means that the Turkish-Israeli-U.S. relationship is firm. * Iran saw an immediate response from former President Ali Akbar Hashemi Rafsanjani, who suggested that there be either a referendum or a ruling by the Expediency Council on the future of U.S.-Iranian relations. Though the Foreign Ministry claimed that everyone misunderstood Rafsanjani (no one did) there were very positive comments exchanged between the British ("the Iranians were quite helpful in the war") and Iranians ("We will close our borders to fleeing Iraqi leaders"). Finally, the United States bombed an anti-Iranian group operating in Iraq on April 15, providing a substantial down payment on future relations. The Iranians also are realists and know from which direction the wind is blowing. They will cooperate. * Kuwait: Well, Kuwait allowed the United States to launch its invasion from there. * Syria: Finally, Syria. It is interesting to note that at this point, Syria is the only country bordering Iraq that remains completely resistant to U.S. power. The reasons for this divide into three parts. First, the Syrians genuinely misread the first week of the war and concluded that the United States might be in trouble. Officials in Damascus thought Iraq might give the United States real problems and defined their position from that. Now they don't know how to back away from this position. Second, a huge amount of money is passing between Iraqi leaders looking for a haven or safe passage and Syrians. The Syrians have no love for the Husseins, but they are businessmen, and there is money to be made. The sums make it hard to turn down. Third, the Syrian government is hard-wired into groups like Hezbollah, which is one of the foundation stones in its occupation of Lebanon. Washington is demanding an end to these relationships. It is not easy for Syria to deliver. Therefore, the United States appears to have moved directly from a war in Iraq to a confrontation with Syria. That is true, but the story is much more complicated than that. First, the United States has moved from the war to a redefined relationship with the entire region. Every nation bordering Iraq is recalculating its national interests, based on the probability of a long-term U.S. military presence next door. The Syrian resistance must be placed in the context of the broader movement toward accommodation with the United States and its own peculiar status. Second, a confrontation with Syria is very useful to the United States at this moment. It sends the exact signal Washington wants to send to the Middle East and the entire Arab and Islamic world: The United States is not tired out by the Iraq war, it is eager to press its advantage and more dangerous than ever. That signal has caused everyone to re-examine the premise that Iraq would represent some sort of closure. Finally, the Syria confrontation is the segue into another round of Israeli-Palestinian negotiations. Everyone should recall the Saudi initiative of last summer, which argued that there could be no agreement on Iraq until after the United States dealt with the Palestinian question. Although logically a non sequitur, the politics were these: The United States guaranteed Riyadh an Israeli-Palestinian initiative as the price for a shift in Saudi opposition to the war. Now, Saudi leaders have never been deeply concerned with the Palestinian issue; they have no love for the secular, socialist radicalism of Yasser Arafat. But they have a domestic political problem: Under heavy pressure from the United States, they had to show the domestic opposition that they had gotten something valuable out of collaborating with the United States. It wasn't much, but the promised U.S. roadmap for Palestinian-Israeli relations at least allowed Riyadh to show that Saudi leaders had picked up something of value. Thus, at a press conference before the war and at the Blair-Bush summit near the war's end, the Israeli-Palestinian issue was prominent. The United States, after the Clinton administration's Camp David initiative, had absolutely no appetite to try another round of definitive negotiations between Israeli and Palestinian leaders. But it was the price, and the Bush administration was going to pay it. But they also figured out a way to make lemonade out of lemons. It went like this: Everyone knew that the fundamental problem in any Israeli-Palestinian negotiation was that Arafat does not control all the Palestinians. Arafat cannot deliver Hamas, Islamic Jihad and other outriders in any deal. Therefore, no matter what deal is negotiated, Arafat cannot deliver the one thing the Israelis want above all else: an end to Palestinian operations against Israel. Therefore, not only is no deal possible, but as soon as a deal appears to be possible, the net result will be a Palestinian action followed by an Israeli reprisal followed by ... and so on. Washington reasonably could say to Riyadh that the only possible chance for the roadmap to work would be if the Palestinian radicals were forced, by other Arab countries, to buy into the negotiation process. The key for that is ending outside financial and logistical support for the Palestinian rejectionists. The main source and conduit of this aid is Syria, which supports Hezbollah as part of its Lebanon strategy and allows other radical groups to operate out of Damascus. The United States intends to shut down as many of the radical movements as possible in the Arab and Islamic world. Thus, Washington used its agreement with the Saudis to pursue an Israeli-Palestinian settlement in order to justify dealing with Syria now. It was perfectly logical: If the Saudis want a roadmap to peace, part of that road must run through Damascus. Since the Saudi regime has no use for the Assads -- years back, the radicals they supported had targeted the House of Saud -- officials in Riyadh were not going to get all that upset over it. The Turks don't like the Syrians at all, nor do the Jordanians. Iran has collaborated with Syria, but they have more important issues to deal with than Hezbollah and the Syrians -- such as the U.S. Army sandwiching them from Iraq and Afghanistan. Therefore, U.S. Secretary of State Colin Powell said April 16 that he is planning a trip to the region to begin working on the Israeli-Palestinian roadmap, and that he plans to visit Damascus for some frank discussions -- as a show-down is politely called among diplomats. The United States has turned the tables on Saudi Arabia, in other words. Riyadh made its cooperation against Iraq dependent on a U.S. commitment on Israel and Palestine; Washington has said that any serious commitment on that issue logically presupposes dealing with Syria. Saudi leaders, then, have to back the U.S. confrontation with Syria -- unofficially of course. Hard to argue with that logic. Now, we are not particularly optimistic that this initiative actually will amount to anything vis-r-vis the Palestinians. But it will buy several months in which the focus will be on the Israeli-Palestinian situation -- away from the undoubted difficulties that Iraq will pose in that time, and away from the diplomatic maneuvering to get the region lined up the way Washington wants. If it works, that's great. If it doesn't, the United States will have tried once again. In the meantime, Syria faces a dilemma that it hasn't confronted since the Baath Party came to power: The Israelis are still to their southwest, the Turks are still to their northwest, but now the Americans are on their eastern border and they seem not at all averse to trying out their neat toys again. In essence, with the end of the war, the United States has become the foundation of a new regional order and an absolute wild card. In the Middle East, where every government has spent a generation becoming predictable, the United States is utterly unpredictable. And that means that every country either accommodates the United States or faces serious uncertainties. Syria must know that even Washington doesn't know how it will behave if pushed. Therefore, as pessimists, they must assume the worst. On April 18, foreign ministers from the region and Egypt will meet in Riyadh, where they will consider the fate that has befallen them. On 28 OCT 2001, Canadian Web Maestro, Jacques Prolux complimented this newsletter saying it "excelled in presentation, design, and content in addtion to a good use of graphics, reports and pictures", as he presented FLIGHT LINE with his Golden Eagle Award for Public Relations. McCampbell's Aces is a Tax-Exempt fraternal, non-political, all-volunteer membership organization belonging to the Association of Naval Aviation. 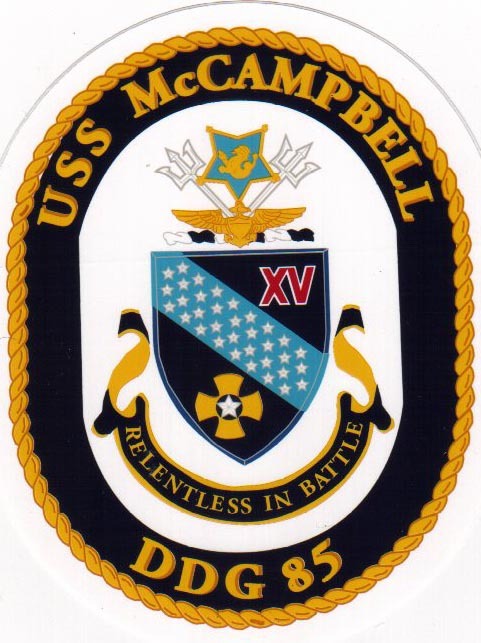 Seal from the USS McCampbell. Deisgned by CDR Mark C. Montgomery, USN, the ship's first commanding officer's wife. Use the link to go to the ship's site. The Valiant Air Command, located in Titusville, FL, is where a group of dedicated individuals restore and preserve Warbirds from WW II and later. Their museum is arguably the best collection of aircraft and artifacts between there and Pensacola. The most recent project, dedicated on 16 June 2001, was the restoration of a 49 year old Grumman FM - 2 salvaged from Lake Michigan by the U.S. Navy. See picture below. Click link below to see ENS Dixie Howell, SPLASH his FM -1, taking off from USS Sable into Lake Michigan, just off Chicago, IL on 2 SEP 1943. Above Photo from US Navy Archives is of the USS Wolverine, IX 64, sistership to the SABLE. 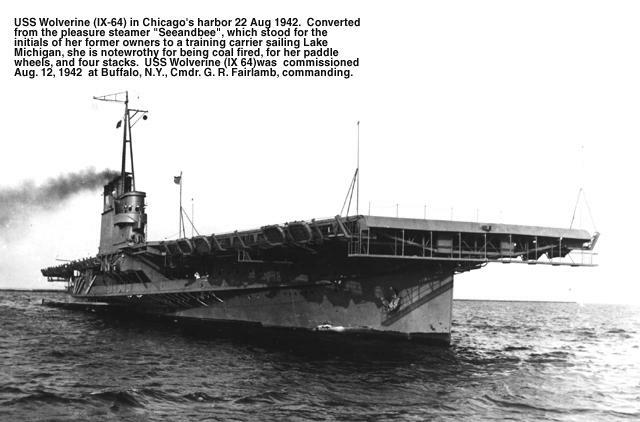 She was photgraphed off Chicago on 22 AUG 1942. Both ships were converted from Great Lakes coal fired pleasure steamers. Note the paddle wheel propulsion. RADM Bill Moffit, of this squadron, among many others, qualified on this carriers in 1943. Where 70,000 men and women, both military and civilian, are united by an interest in free and independent debate of issues facing the nation's military forces. The Naval Institute has served as the source of information on maritime history, reference, and analysis and discussion of current affairs with out interference since 1873. Articles, graphics and pictures are also protected by the rights of their respective owners. Visit Go Palm Beach.com "Your link to life in the Palm Beaches" for sports, weather, events, news and more. CLICK HERE! The Navy Memorial Foundation's Navy Log is the only public register of personnel having served in the -- Navy, Marine Corps, Coast Guard, and Merchant Marine. -- Nearly 250,000 persons are enrolled thus far -- CLICK HERE.